Ok, so we're getting into the home stretch of designing the Delores Edmund character development process. If you haven't read the previous installments on the blog you might want to check them out before proceeding. We started with a text description for the character, then went through the process of gathering reference material, our thanks to everyone who participated, then went on to the character sketching stage. Now we've proceeded to take three of the most likely sketches to the current in-game character style pixel render stage. These three were chosen through a combination of backer feedback, friend and team preference and because Ron and I said so. When I was originally designing the characters for Maniac Mansion I went through this same basic process, sketching the characters as felt pen renders and then trying to take those over to pixelcentric game characters. In those days, a lot of technical issues drove how I'd render them on the C64. They could only be a limited width and palette. The main thing that drove their big-headed-ness was Ron and I really wanted unique/recognizable characters, trying to make a unique looking face 5 or 6 pixels wide using 3 colors (one of which needed to be black) really drove their now iconic appearance. Today, basing Thimbleweed Park's characters on this approach is definitely a choice. We still want to evoke that iconic feel, however updated with additional palette and a broader range of animations. Conversely, adapting Thimbleweed Park characters into big headed pixel versions at this stage is now fairly straight forward for me, as I'm pretty familiar with how most of the characters need to look in that style, it's mainly an exercise in taking one stereotypical set of parameters and shoehorning them into the next. What I mean by that is having simplified a set of characters into felt pen sketches- it's relatively straight forward to adapt those characteristics into a similar set of pixel constraints. Additionally, there's a simplicity and iconic nature to this step. The characters need to be mainly composed of basic color components with some rendering and be easy to tell apart and identify. One of the things about these pixel rendered characters that's deceptive at this stage, is we're still looking at them in a very stiff cardboard cutout style stance. This is so we can see what they look like from purely an almost graphic design perspective, are the colors and shapes of a character aesthetically pleasing, does it mesh with the others? Once a character is actually in the game and animating, you're never really going to (hopefully) see them in this boring of a stance, there will be a ponderation and attitude to they way they stand and balance their non-existent weight (even for this style of character) which should make them seem much more interesting and alive. The next and pretty much final step will be to take our selected pixel version and do a little bit of additional fine tuning of colors, skin tone, shading, and a few other details. Once we've decided on a final we'll create a number of reference angles (front, side, back, three-quarters) and a variety of poses. This will be the guide we'll use to create her final animations in the game bringing her to life as yet another memorable Thimbleweed character. Far right is the one. My personal favourite is surely the one in the middle, though I would give her a little edge to hairstyle. Like a strand of hair dyed in a bright color. Or one side of her hair put up against her head. She looks absolutely like a character! Gary, I still think Delores.hot should wear a Star Trek-insignia and classic 3D-glasses (red and blue) instead of ordinary glasses! That's good. The pants especially could have some color. Maybe even some psychedelic texture. I like the middle one, but I prefer the left hand ones hair. I think a pony tail would be interesting moving about in this pixelated style. Somehow to me it looks like they're all making a duck face, or maybe saying "oooooooh"
I agree. I like this Maniac Mansion art style but the mouth looks strangely o-shaped. Maybe three pixels of height are too much for mouth/lips. I know what you mean, it's because there are pixels above and below the mouthline, and quite dark pixels too. It is supposed to be the lips, heh. The first one is the one for me. Second is nice too, but I don't like the third one. I choose middle one as well - and just like Malc, I would give her a pony tail. The middle one is my favourite. The other two ones appear a little bit strictly. In addition the left one seems a little bit too girlish to me and the right one a bit too well-behaved (because of the smooth haircut and the bulky eyebrows). The middle one. With the head of the left one! The middle one looks to much like Dave Miller.. 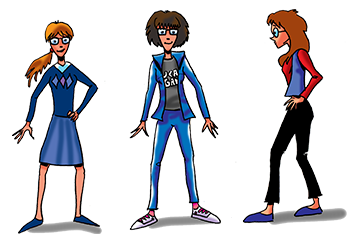 I like the leftmost one very much, but although very "geeky" she does not seem like one who likes nerdy-and-geeky stuff such as Star Trek. Perhaps the most realistic is the rightmost one. With a bit of different hair-styling. I like the middle one best, although her hairstyle looks a bit stiff and dusty compared to the respective drawing. I like the middle one, but the hair needs to be a bit more edgy, as someone said before. The ponytail definitely draws me to the left one, tho now others have suggested a bodyswap, I could go along with that. I like the one on the right best - the face, the hair, the body all look kind of like I though of Delores. But maybe she could wear the middle ones top and jacket? Anyways what really gets me is your typo: "...Thimblewed characters..."
I prefer the one on the left. But i hope the rejected designs somehow will end up in the game. For example as background folk. The head from the first one, shoes from the second, and the body and legs from the third. That would be my personal favourite. What ever you choose though, I think mixing and matching is going to be the best choice. In an interview with Matt Barbon (Matt Chat #138 on YouTube, I think) David Fox mentioned that back in Lucasfilm Games days the actual development (code, at least) was done on SUN machines hopping over to the C64 from time to time. And all other ports stemming from that. Can you shed some light on the process/pipeline back then? Which machines were coders using? Was it the same for the art dept.? Did you use C64 "native" tools to draw your stuff, or something else? Did you use more powerful workstations to prepare stuff before loading it into the C64? Ok, so I'd have to imagine the LFG setup back then as a number of machines all hooked up to a central VAX server, via Ethernet or whatever it was called in the 80s, with some of you rocking SUNs, and others working on beefed up C64s - C64s with networking (!)... strangely impressive. Sorry if this has been answered before but I was wondering what tool you use to create the pixel versions of the characters? An old copy of deluxe paint lying around perhaps? Actually Mark and I are both using photoshop. I suppose that Photoshop is extremely different from Deluxe Paint. Is Photoshop really a sufficient replacement for Deluxe Paint in terms of retro artwork? Or would you still prefer D-Paint since Photoshop is designed for too modern purposes? I am not sure about the mouth? Looks like oooohh. I choose the left one. Middle one, but with a bit lighter hair color, or with a neon color streak. I love the one in the middle, although I would change her clothes so they are more colorful! Far right is my second best. middle one, maybe give it a try with the left ones head. I was in doubt when I first saw the three final candidates fully drawn (I guess part of it was they don't look a bit like what I proposed). Anyway, when I scrolled down to the pixel art they took life and I really like all three of them, with some tuning in tones and tiny details you will certainly polish. They are awesome, although the one on the right is a bit too plain, not that memorable.